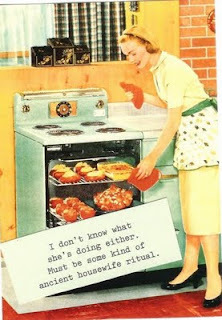 I’ve seen this wonderful card in a few different places, it’s a picture of a 50’s wife opening her oven door, you can almost smell the amazing baked goods that you can see in the oven, it’s an idyllic sight. However, the caption on the picture reads, I don’t know what she’s doing either. Must be some kind of ancient housewife ritual. This is the image the reading from Proverbs stirs up in me today. I actually am not going to take much time talking about Proverbs, but after hearing it read, I want to talk a little about Wisdom in general, rather than this passage in particular. Remember, we’ve been hearing from wisdom literature for some weeks now, and I did talk about it a few weeks back. I commented then that Wisdom in scripture is not just about being wise as opposed to being foolish. But that God has built wisdom into the fabric of the cosmos. And we learn from wisdom that there are certain ways of living in which people thrive, and other ways of living which lead people to death. Ordering your life to Wisdom is what we read about in these scripture passages, in Proverbs as well as in James. In James, Wisdom is that which connects us to the divine, and that connection presents humanity with a different kind of community, the kind of community that is ordered to Wisdom, but it is Wisdom that cannot be possessed, Wisdom that is not pursued. This is the kind of wisdom our culture does not value, the wisdom born out of the possibility of being wrong. This is the kind of wisdom that requires fear and trembling before God, the kind of wisdom that allows us to fall on our knees and ask forgiveness when we are wrong. This is Wisdom that is peaceable, gentle, willing to yield, full of mercy and good fruits, without a trace of partiality or hypocrisy. According to James, this is the community God imagines, and this community is very different from what the first hearers of James imagined as possible. The Greeks had been worshipping Gods that were pretty full of themselves. Recall your Greek mythology, the pantheon of gods who intervened in human history were fickle and always immortal, or trying to be so. And the social world of the 1st century was clearly based on honor, status, and class. The community imagined in James was based on gentleness, mercy and forgiveness that bears fruit. And it is now we turn to Mark, and the second time Jesus tells the disciples that he would be killed. It seems to me that the disciples in Mark are as far from wise as anyone can get. Jesus tells them that he will be killed, they don’t quite understand, and yet they too afraid to ask him, and, then, instead of offering any sort sympathy, they argue about which one of them is best. Jesus then describes what this whole servant thing may look like. Jesus says whoever welcomes one such child in my name welcomes me, and whoever welcomes me welcomes not me but the one who sent me. We often assign sentimentality to this passage, recall the paintings of Jesus and the children, but this passage really isn’t as much sentimental as it is subversive. Remember that children as well as women in 1st century culture and political structure have no status, they are of no account. Jesus is showing us the image of invisible people in society, people who did not have rights, the one’s who are overlooked, the ones used as a commodity, and Jesus is showing us that these are the people that look like him. To be a servant, is to welcome those who look like Jesus, the marginalized, the outsiders, the ones with no power. In the face of Jesus’ death, the disciples are concerned about who is first, and Jesus is concerned about showing the disciples what being a servant looks like. What does all of this have to do with us? Our society suffers from a debilitating addiction to greatness, not unlike the disciples. Which one is the best is a question that is asked and answered with the unending number of competition reality shows and award shows on television. Seldom is one's popularity based on servanthood. Seldom is honor and status awarded when we order our lives to wisdom, to gentleness. Seldom do we win any awards when we yield to others, when we approach one another with humility. The Wisdom that is embodied in these stories is that in the midst of all that the world deals us, we are to order our lives to gentleness, to humility, to mercy. We are to welcome those who are like children, the invisible and the overlooked, as if they are the very embodiment of Jesus. We are to be participants in this new community that God imagines. We debate and we argue while the invisible and the overlooked are starving to death, while the invisible and overlooked are dieing from diseases that could have cures, while the invisible and overlooked are cast away like so much trash. We debate and we argue about who is first and who is last. We debate and we argue about who is right and who is wrong. It doesn’t’ matter. It just doesn’t matter. The gospel according to one of the great folks in our universe, Garrison Keillor, goes like this. Garrison was recently hospitalized for a stroke, and he writes, two weeks ago, you were waltzing around feeling young and attractive, and now you are the object of Get Well cards and recipient of bouquets of carnations. Rich or poor, young or old, we all face the injustice of life -- it ends too soon, and statistical probability is no comfort. We are all in the same boat, you and me and ex-Gov. Sarah Palin and Congressman Joe Wilson, and wealth and social status do not prevail against disease and injury. And now we must reform our health insurance system so that it reflects our common humanity. It is not decent that people avoid seeking help for want of insurance. It is not decent that people go broke trying to get well. You know it and I know it. Time to fix it. We all live together on this rock, we are all in the same boat; we are all beloved of God. It’s time to treat people as if they were like Jesus. That’s what Wisdom says.